It was one of those colourless days. The sky, the streets, the general surroundings… all was so muted, so drab, so blah. There are days like that. Every time I go out for a walk, I have my camera (phone) in hand (OK, maybe in pocket! ), just in case something, anything, catches my eye. Some days it just seems like same old, same old and nothing inspires me. On other days, like this particularly drab one, I have to look more closely. 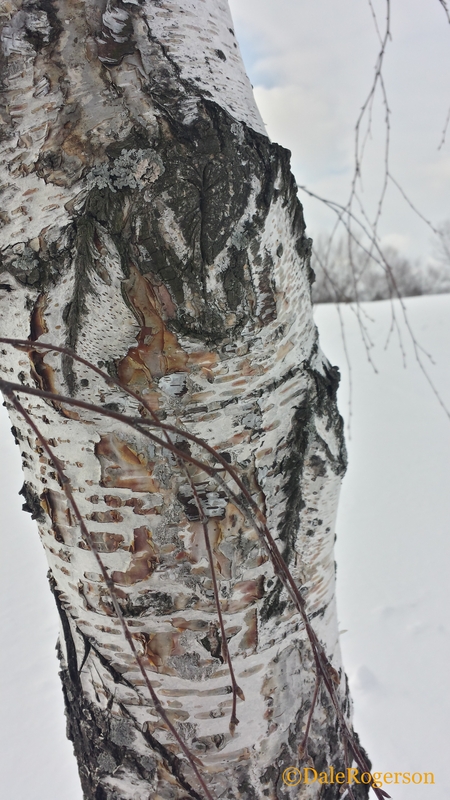 I start seeing the subtlety that is around me and it realize it holds its own kind of beauty, like this birch, which, upon first glance appears to be white and black but upon closer inspection, reveals a bit more. I turn around and feel like I am in a black and white movie until I notice the palest of blue in the sky trying desperately to peek through the clouds and am surprised by the pop of the neon yellow school sign. And of course, a walk cannot, NOT include some pics of my Zeke! Have a most wonderful, hopefully more colourful, week, dear readers! Wonderful post, D. Your Birch tree photo would make a nice drawing…..
So…what are you cooking and…what time is dinner? Lemme see… As I splurged on an onion bagel with cream cheese for breaky, lunch will be a simple salad with avocado, chicken and maybe some strawberries. For dinner, I have some hamburger meat that I’m gonna make into “bulk meatballs” for future soups, pastas, whatevers so tonight, will be an old fave my mom used to make: meatballs in a tomato sauce (made with tomato soup, mustard, brown sugar, Worcestershire sauce…) with mashed potatoes and, if I were to do as Mom used to do, a can of peas. I don’t do canned peas any more so I’ll have me some asparagups. Tell me, why is it so comforting to go back to the easy-peasy meals of our youth? OH NO THIS IS BEGINNING TO GET SCAREY…my Mom used to make the same hamburger balls (only with a wee bit of added rice…we called them Porcupine Balls) but with the same [other] ingredients. Cooked in the tomato soup “sauce”, then dished out over mashed potatoes. One of my favourite comfort foods…reminds me of growing up, family meals, sister squabbles over whose turn it was to do the washing up..etc. etc. So…there you are! Sisters. Stay out of my clothes closet. No. You may not wear my blue sweater today…..
OMIGOSH! This is too hilarious! Told ya… totally kin-souls (maybe even kin-sisters)… Jeez Louise! Only time sisters went into MY closets was when I wasn’t around! Lisa still talks about stealing my favourite outfit and dirtying it… was sure I’d beat the crap outta her…. she got away with THAT one! Just wonderful. The closer you look, the more you will see. I believe that we need days like that to just find this kind of beauty. Thanks. I do believe you are right on that one. A post close to my own heart, Dale! I’m the same way with my ever-present camera-phone, searching for new ways to see things. And of course, I love to see portraits of Zeke. Such a handsome fellow! My Delilah would love romping around in the snow with him! Zeke sure adds some nice color to the photos. You should post some of his baby pix! So funny you should say that… as I told Joy, I found some “old” pix of him when we got him. I will definitely do a post on his evolution!